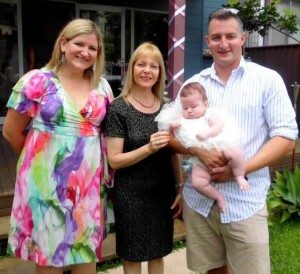 A Naming Ceremony Celebrant in Bondi Junction, covering all Sydney suburbs. Another happy meaningful naming day ceremony. As your celebrant, we will work together to craft a beautiful ceremony for your child. Here we included beautiful readings from the parents, as well as the rose petal ceremony ritual. So at the rose petals ceremony, we scatter petals in four different colours on the child’s head with different blessings. You can either have fresh rose petals, or silk ones from me. A naming ceremony can take place anywhere you want. This ceremony was in the family’s lovely backyard with lots of family and friends welcoming this young baby into the family and the community. This entry was posted in Marriage celebrant, Naming Ceremonies, Naming Ceremonies Celebrant, Sydney Celebrant and tagged Baby Naming Ceremony, Baby Naming Day, Budget Celebrant, Cheap Celebrant, Naming Celebrant, Naming Ceremony Celebrant, Naming Day Celebrant, Naming Days, Sydney Celebrant.